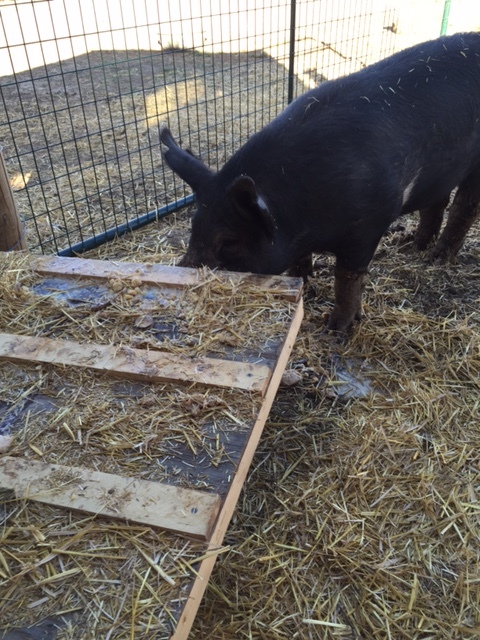 One Wednesday, Bossy the pig goes to the processor. The other two went about a month or so ago. I can tell you with conviction, that if we had no other reason for having a hobby farm, the produce and meat would be reason enough. Oh my god is that bacon and ham amazing! The first two went off first because they were no trouble to get on the trailer. Bossy, having some issues with her hips, wanted nothing to do with getting loaded. We figured that if we forced her on, the other two might try to come back off so we decided to keep Bossy Britches another month. You could tell she was lonely being all by herself, but she thought it was the best thing ever to have all the food to herself! As a result, she is easily 300 lbs. To get an idea of how much meat that translates into just multiply by .68. We got 350 lbs of meat from the other two. If Bossy is 300 lbs then there is another 200 lbs on the way! Good thing our neighbor wants a bunch! The hams are HUGE and I could eat the sausage every day! Now here’s the thing. 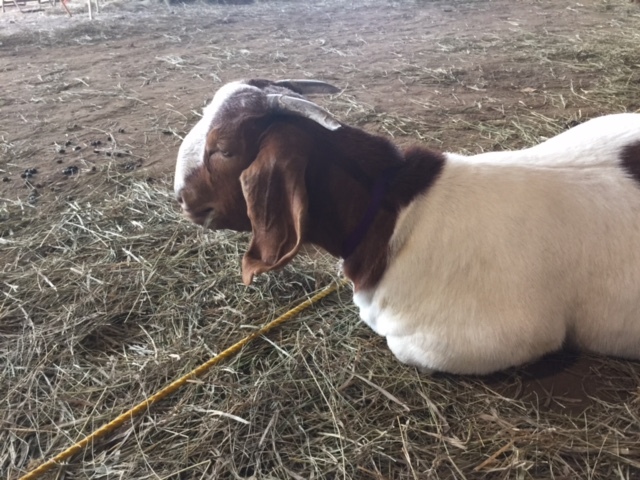 We bought them from a breeder, fed them nothing but expensive organic feed, apples, milk, bread, and whey protein, had them butchered by the shop the next town over and it worked out to about 5 buck a pound start to finish! You can’t buy factory pork for that price! This was boutique meat. The finest of the fine and raised about 200 feet from where I am sitting. Not only do we have chicken and pork for at least the next year and so do my neighbors in town, it has had no, Zero ZIP antibiotics, they weren’t raised in cement floored crates, they lived outside, the manure was used for compost and fertilizer not held in football sized lagoons, they lived a good life, and the meat is better than anything you have ever tasted! So today the Freezer Camp Express got backed up into place so she could get used to it being there. 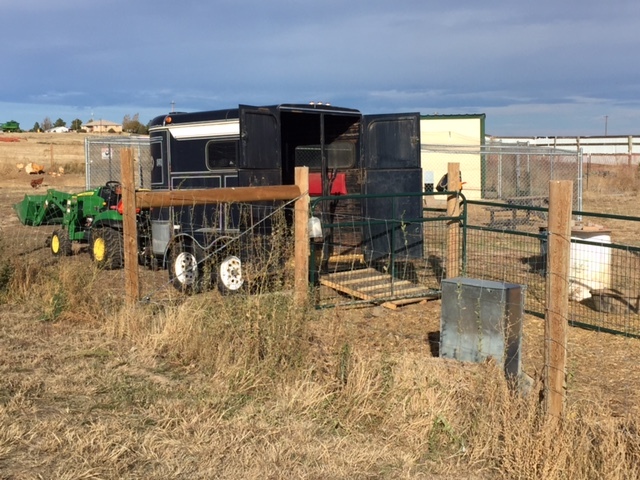 A couple of ranch gates I have were strung up to make chutes, and Wednesday morning off she’ll go. We are so enthused by all of this we are considering raising and breeding our own. They are no more trouble than dogs (easier actually) and a whole lotta fun. If a football team had a squad of these porkers on the front line they would not be disappointed. 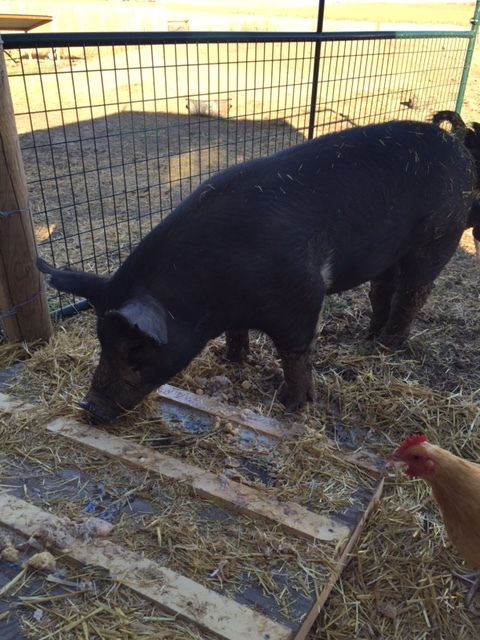 Pigs is STOUT! We have been building out this farm for 3 years. 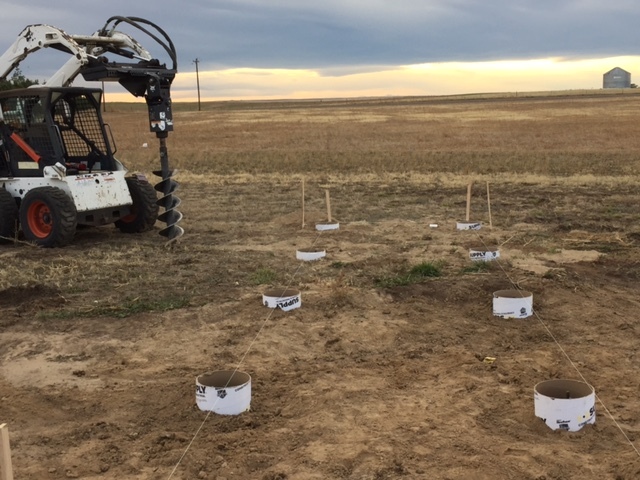 Time off from work and farm construction has been virtually non-existent. Also, while we have had our followers during all of these years behind the hammer and drills, we have never had a time where we could sit and just chat and swap stories about our successes, failures, and future developments with other hobby farmers. A great friend of mine from archery, due to various reasons, found himself living in Michigan only about 90 minutes from where I grew up. We used to talk everything archery and shoot a bunch together. I hadn’t seen him in several years since his departure. We hooked up via text and email about a year or so ago and were both absolutely stunned by what we found out. We had both gone off, bought land, and proceeded to destroy ourselves physically by building farms!! Ours grew out of gardening, and theirs grew out of dairy. Understand this though – in all the years we had known each other we had NEVER talked about it. I still find it uncanny that we have both made this leap to self-sufficiency and simple living! 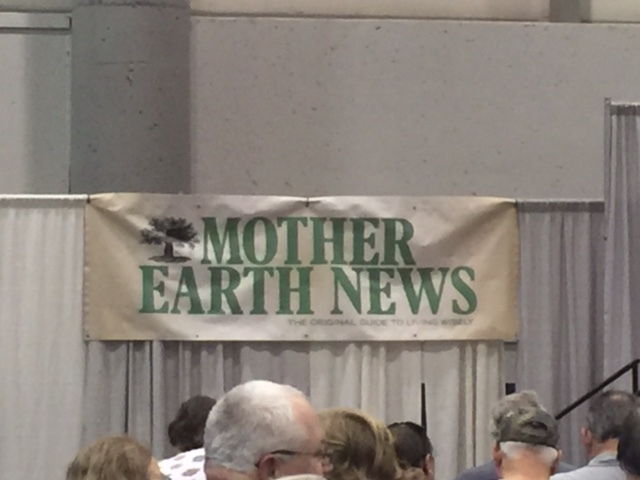 Every year Mother Earth News magazine hosts their sustainability fairs in various places around the country. 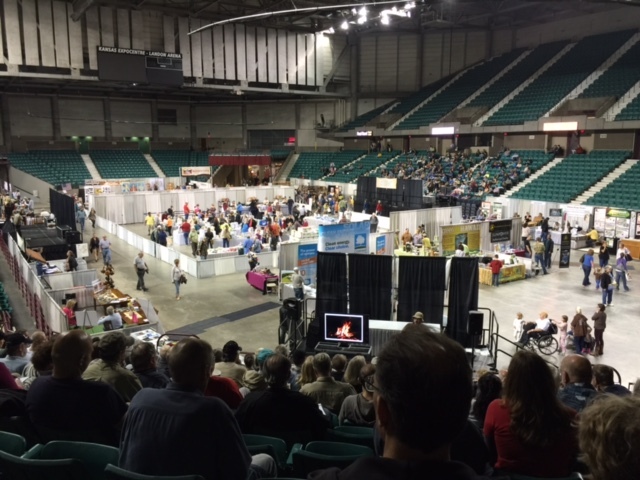 It is a collection of booths of many subjects and products as well as seminars spaced throughout the weekend. We saw how to build straw-bale houses, keep bees, winter gardening, making solar panels, rocket mass heaters, and many others. 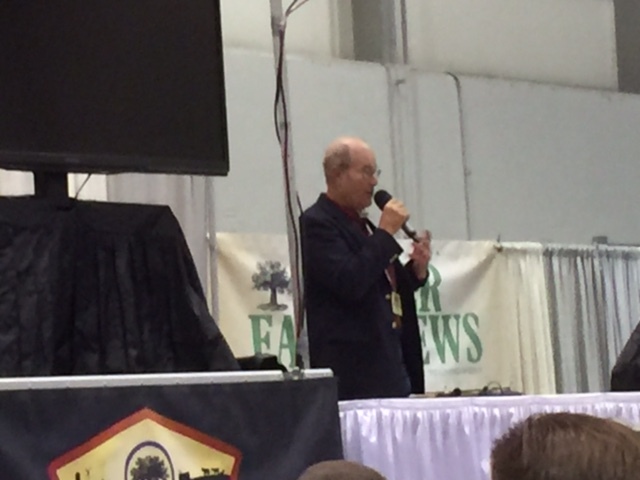 Two of my heroes, Wes Jackson, a biologist and Joel Salatin – the guru of the small farm movement were also there. 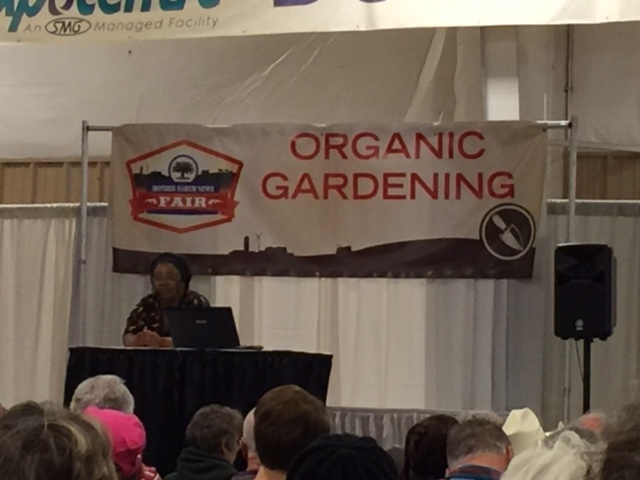 Paul, his wife, son – in – law, Zina and I decided to meet at the fair in Topeka, Kansas. We had an absolute riot! We went to breakfast, out to dinner, hung out at lectures, wandered booths (I even got to meet a Facebook brother face to face for the first time and bought one of his hand made brooms!) It was just the ticket! It was a short weekend with two long drives at either end, but I wouldn’t have traded it for anything. It has been so long where traveling didn’t mean having to visit family, or clients. The astronomy star-parties are fun, but the total upheaval of one’s sleep schedule makes it not as relaxing as it could be. All in all the fair was pretty basic. I have my ideas on how the vendor displays could be more homestead-ish and self-sufficient oriented than they were, but if my friends want to hook up again at one of these things, I’m all in. Paul, Cindy and Jonathan, it was so great to see you! Another way to be more self-sufficient and not burn so much fossil fuel is to use the sun and other sources to cook with. Because we have about 350 sunny days here it simply doesn’t make sense not to use that big old nuclear reactor in the sky as much as possible. The solar electric system is the big chunk of that. Solar hot water will be next. 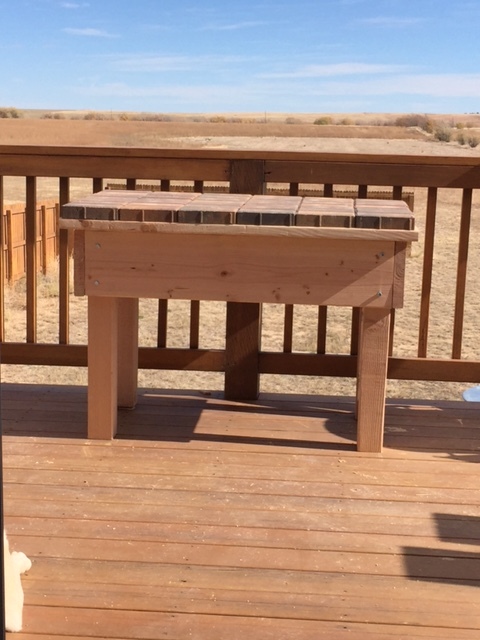 Thirdly, we have put together a fun and relatively inexpensive outdoor kitchen on our back deck. 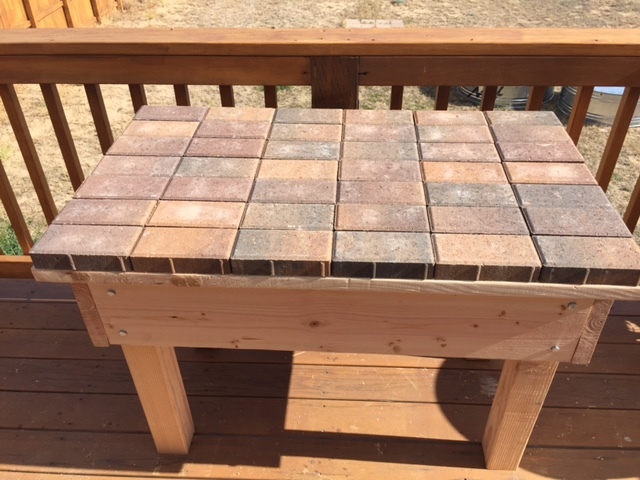 Some of it will use propane, some of it charcoal, another piece will use wood and the center piece is a solar oven. 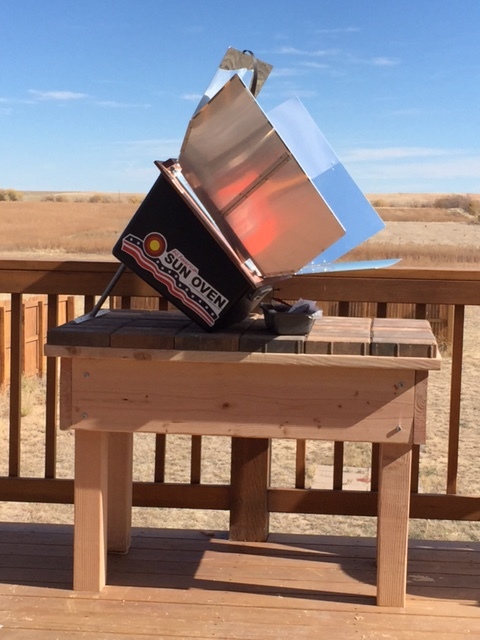 The propane is primarily for heating the pressure canner for food storage. There will also be a propane grill. For the smokey tastes we have a Weber charcoal grill which can also be used to make pizza. The newest additions (thanks to American Express rewards points!) 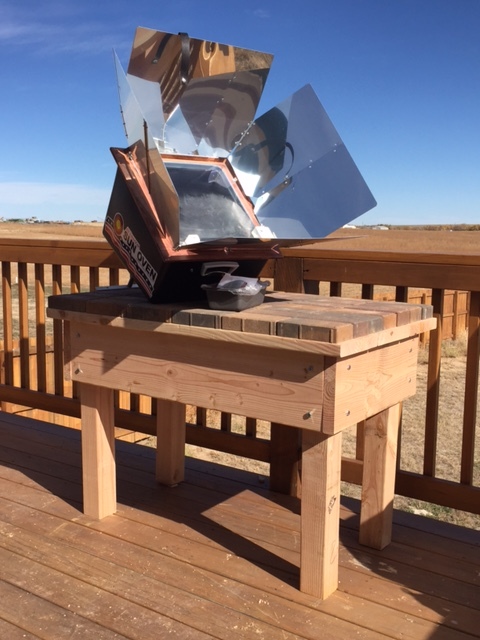 is an All-American Solar Sun Oven and what is called a Rocket Stove. The rocket stove burns very efficiently and really only uses small twigs and branches to cook with. It can boil a pot, heat a fry pan, and I’ve even seen it used to can with. The solar oven is a lot of fun. The mirrored panels direct sunlight into the cooking area. Today while I was doing the “pre-first use” seasoning for it, I had it up to over 300 degrees. No electricity, no gas, no moving parts, in November! Just aim it at the sun and it works just like an oven in the house. This thing will get used a LOT to heat things up. So here ya go! Lots of ideas. Hopefully we will see more folks doing these kinds of thing as well. Change does NOT have to be drudgery. This is a total kick! The Solar Project Is Half Way!! 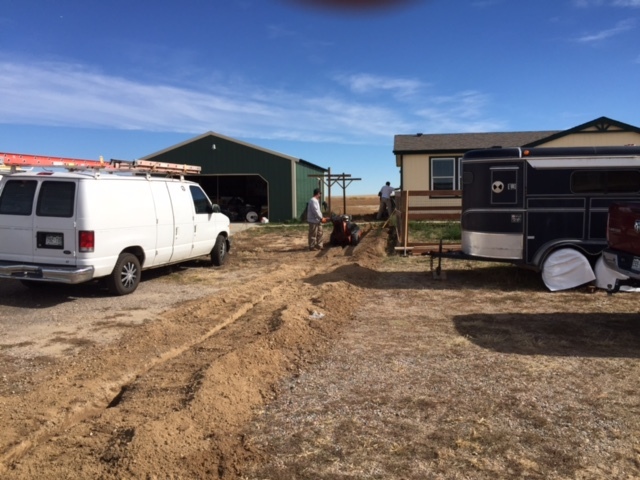 So the project to take the JAZ Farm off grid is finally progressing as it should have all along. The gear is here. 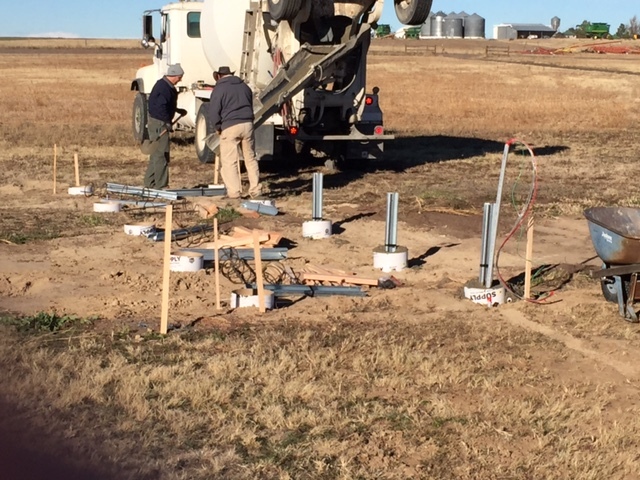 The footers are poured. 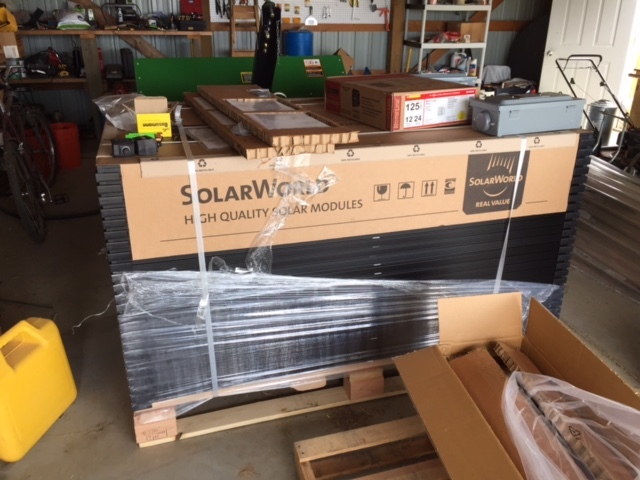 The ground mount racking is here and the SOLAR PANELS ARE ACTUALLY IN THE BARN!! Who would have ever have thought that there could be so much dishonesty, fraud and corruption in the the alternative energy industry? 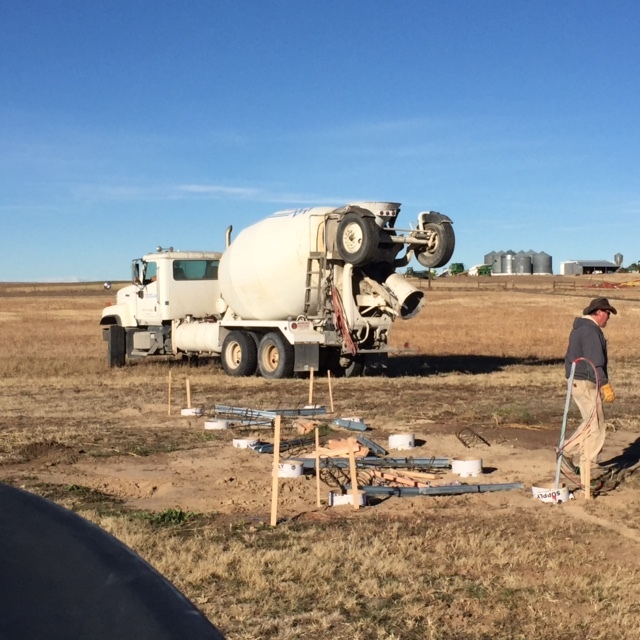 Troy and his crew have been outstanding, even coming out this past Saturday to get the footers poured. All I can say is buyer be ware. It may look good, but don’t pay ’em til they deliver. The world of humans never ceases to delude me. So anywho, the project is finally progressing. This is called a Grid-tied system with battery back up. For all intents and purposes this takes us off the grid but not quite 100%. The solar panels are the primary source of electricity. If we consume more energy than we produce, the electric company is the back up and will provide us with power (like at night watching TV when it is dark outside). If we produce more electricity than we use (which is more likely the case), we sell it back to the power company (essentially spinning the meter backwards). However, IF the power goes down, the magic boxes in the basement kick in. 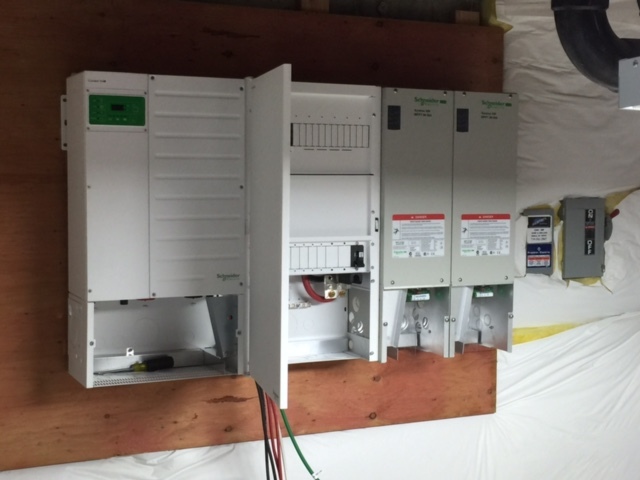 The panels separate themselves from the grid and their sole job is to keep the batteries charged up. The batteries then are the power source for the house. 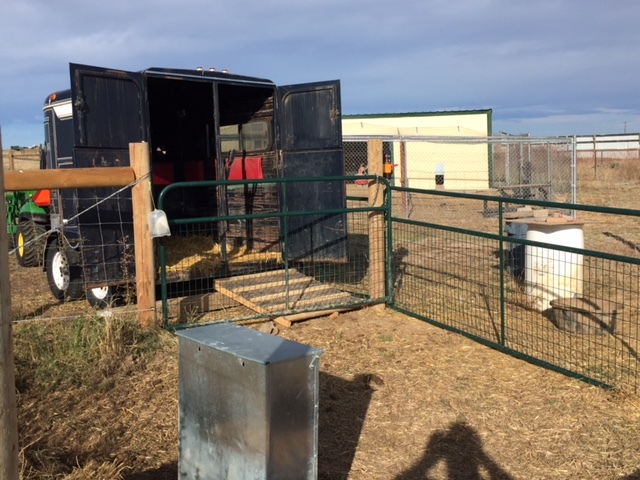 They are wired to keep the well pump pumping, the refrigerator and the chest freezers running, the furnace working, and power to the master bedroom. During the evening the batteries would be the sole power source. During the day, the solar panels provide the electricity to those circuits and also charge up the batteries. This is pretty important considering that we have hundreds of pounds of meat in the freezer, not to mention the dozens of pre- made meals we have frozen and all the produce we have stored up. We anticipated that before Thanksgiving the farm will be electricity independent. Once we recover a bit financially from having to pay for this TWICE, we will be contracting with Troy to install solar hot water as well. Once that is done, the only fossil fuel the farm will burn is propane for the furnace and we will be addressing that with a wood stove at a future date.